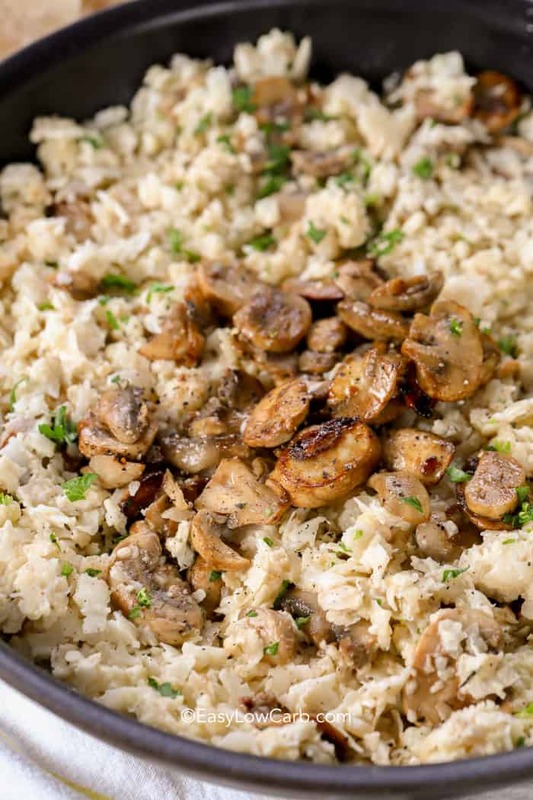 Cauliflower mushroom risotto is one of our favorite low carb side dishes! 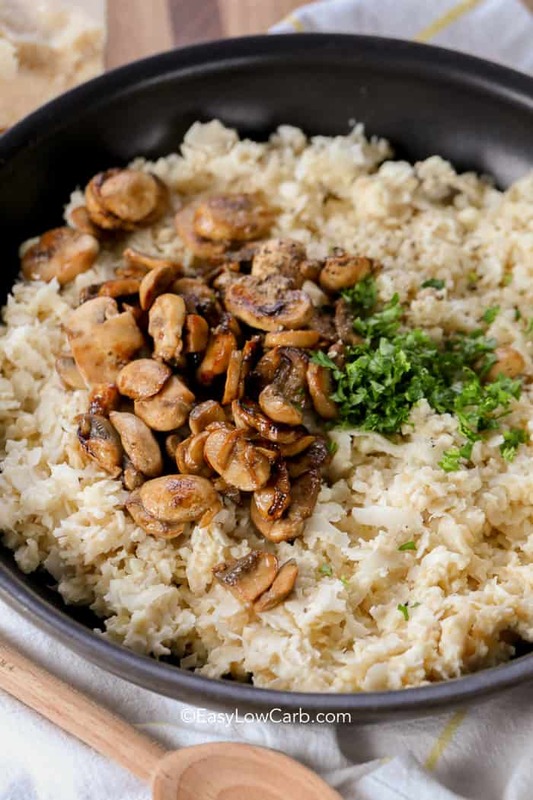 Rich mushrooms are sauteed with riced cauliflower, cream, parmesan cheese, and other herbs and seasonings to reimagine a staple risotto recipe without the carbs. Who would have thought an expensive Italian entrée that takes over an hour to make because of endless pot watching and stirring could be reimagined into a healthy, crazy quick, fancy entrée? Serve it alongside a keto caesar salad and pork tenderloin for the best guilt free dinner ever! Short on date night funds? Surprise your sweetheart with this creamy, flavorful dish and it’ll be love at first sight all over again! 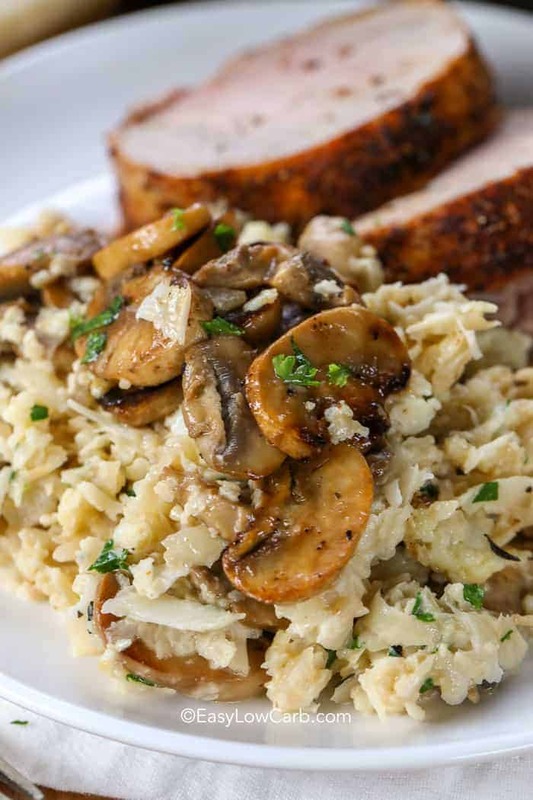 This cauliflower risotto recipe adds (enter mushroom variety here) for a depth of flavor and heavy whipping cream to give it an almost porridge-y like consistency. Sounds creamy and dreamy! Risotto is a traditional Italian creamy rice dish made with Arborio rice and sometimes meat and other vegetables. Most home cooks avoid making risotto because of the tricky nature of coaxing the creamy texture out of the rice. If you’re not sure of what you are doing or you are a novice cook, risotto can be frustrating to make. Lots and lots of stirring! And, who has time for that! 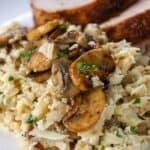 These days, busy home cooks need a simple cauliflower and mushroom low carb risotto that promises all the mouth-watering flavor of the original recipe without the time, cost, or carbs! What is cauliflower risotto? Can’t get over the fact it’s not ‘real’ rice? Just knowing that cauliflower rice has 5 net carbs in one cup versus 53 net carbs in one cup of arborio rice is definitely worth giving this cauliflower rice risotto recipe a try. Cauliflower rice converts to complex carbs that keep you fuller longer than regular rice. Cauliflower is also packed with phytonutrients and antioxidants that protect against cancer. That’s crazy, right? 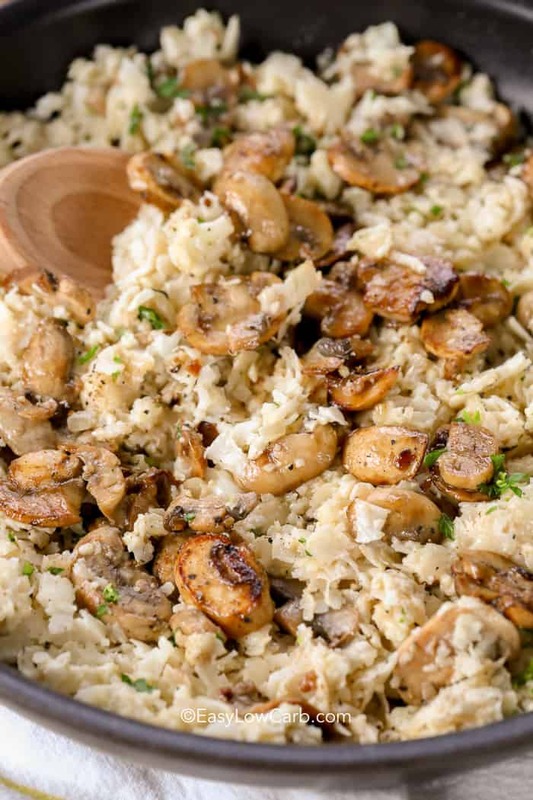 Serve your guests this creamy cauliflower mushroom risotto, they won’t even know it’s cauliflower rice instead of traditional arborio rice! Cauliflower mushroom risotto cooks way faster than traditional risotto, as you don’t need to worry about cooking rice. Begin with the mushrooms. You want to get a nice caramelization on them – this adds a ton of great flavor to the dish! Once everything is cooked, add the riced cauliflower. This only needs to cook for about 9 minutes. Last comes my favorite part, all the cheesy, creamy, mushroomey goodness. Stir it up and serve it alongside some Pork Tenderloin for the perfect fancy dinner without the guilt. Who would have thought a basic cauliflower mushroom recipe could be so easy and taste so good? Mama Mia! Combine mushrooms, soy sauce and garlic. Heat 2 tablespoons butter in a skillet over medium high heat. Add mushrooms and cook 2-3 minutes without stirring or until they begin to caramelize. Stir and cook until cook through. Remove from pan and set aside. Add the last tablespoon of butter to the skillet. Add onion, garlic and thyme. Cook over medium heat until softened, about 4-5 minutes. Add riced cauliflower, seasoning salt and pepper to taste, stir to combine. Cook 9-11 minutes or until tender but not mushy. Add cream, parmesan cheese, parsley and mushrooms (along with any mushroom juice that may have accumulated on the plate). Cook 2-3 minutes or until heated through and cheese is melted. Drizzle with truffle oil if desired and serve warm. Do you steam the cauliflower before rice or do it raw???? You rice the cauliflower raw. This was delicious! I went easy on the thyme but otherwise followed the recipe. Will definitely make this again and again. 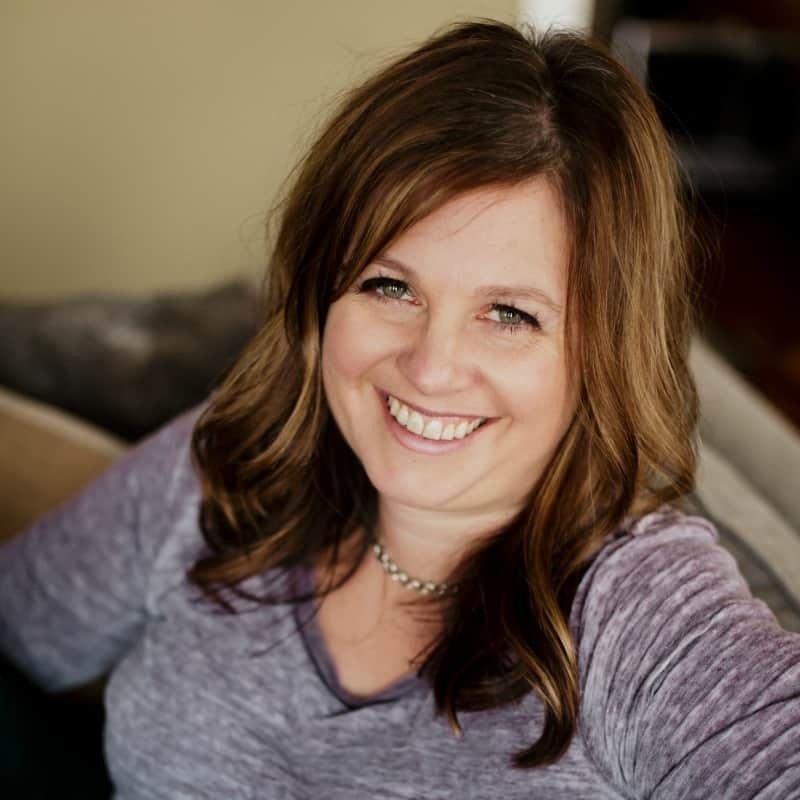 Hi Carol, a cheese grater is a grate alternative to a food processor (pun intended). If you’re hoping to buy pre-riced cauliflower, you will need about 3 cups. Enjoy!